Finally! Time to review Klatch Belle. I will say upfront that I am still learning about what makes a “good” espresso, and I am not as experienced with tasting espressos as I am with coffees. However, this was a very enjoyable tasting for me, and I do think that the espresso shots I made at home have been better than some I’ve gotten at coffee shops! My Vario grinder is still quite new and I’ve only gone through around 1 pound of beans, so the burrs are still being broken in. I had to play with the grind settings quite a bit before I was able to dial in the right size grind for Belle. 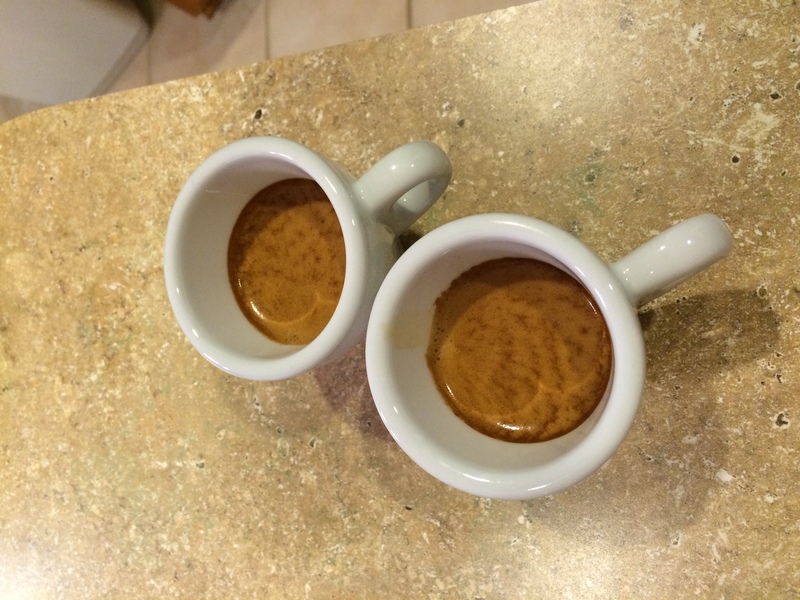 Once I found it, my espresso machine poured some delicious looking shots. The streams were slightly redder than I had ever seen before – definitely on the red side of reddish-brown. Very syrupy in consistency. Stats for espresso geeks: 201 degrees F, 16g in a double basket, 27 seconds from first pour. I really liked these shots. Great crema! The flavor of the shot was wonderfully balanced – bittersweet cocoa and a bit of fruitiness (cherries?). Not sour or bitter in any way – very complex and rich. My latte art is laughable, so I will not be posting pictures of my milk drinks yet. However, I did make a few lattes and flat whites with these beans and they were absolutely delicious; the flavor of the espresso stands up well in milk with no burnt/sour/off flavors… just creamy silky balanced goodness. Shutterbug is a man of few words when it comes to coffee, but when he tried the latte I made for him this morning, he commented, “Wow, this is really good!” Good on you, Klatch. I also chose to try these beans in an Aeropress, just for kicks. I had a bad experience once with using the inverted Aeropress method (and by bad, I mean hot water and coffee grounds EVERYWHERE), but I faced my fears and did it for this review. After having mostly single-origins lately, my palate was confused by the Aeropress brew: I was drinking it and thinking, “I can’t tell where this is from!” But, it didn’t really matter. It was strong and flavorful; smooth with a touch of spiciness that added character. It was VERY easy to drink. Definitely a winner, though I would prefer using these beans strictly for espresso.